In a large bowl add eggs, milk, salt, and pepper. Whisk until eggs are scrambled, set aside. Toast sliced bread in a toaster, panini press, or hot skillet. Set aside. Preheat skillet to medium high heat. Add diced bacon to pan, saute until bacon is crispy, about 5-7 minutes. Remove and place bacon on a plate covered with paper towel to drain the grease. In same skillet, on medium low heat, add scrambled egg mixture. Cook until eggs are no longer runny, stirring the entire time, about 6-10 minutes. 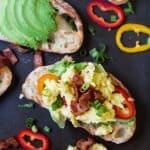 Top each toasted sliced of bread with thinly sliced avocado, sliced mini sweet peppers, 2-3 tablespoons of scrambled eggs, and sliced green onions.